As a recruiter, I’ve heard it hundreds of times over the years: You’re tired of your job, your boss is a nightmare, no raises or bonuses in forever, you feel totally under-appreciated, and you’re really, really ready to move on. Friends and colleagues, and so-called “industry experts”, however, will likely caution you that it’s really not the best time to make a career change; “wait until the job market stabilizes,” they’ll say, just in case you end up without a job at all. The problem is, how long does it pay to remain unhappy out of fear? Maybe the market will never be “perfect” again… maybe our whole understanding of employment is transforming (and not for the better). Maybe now is the best time… you can’t know until you try. Get closer to the industry you’re interested in. The first thing to ask yourself when considering a career change is: what feeds your soul? What interests you? In what sort of environment and in which field do you think you would flourish? Sites like CareerQA can give you overviews of different fields and tell you what kind of experience and education you’ll need to break in. Finding a part-time position in a business related to where you’d eventually like to wind up full-time is the perfect transition. Say you want to become a dental hygienist. Securing a part-time job working the front office for a dentist would be a great choice. Part-time front office work will help pay the bills as you’re taking dental hygienist classes and working towards your certification. Being in the environment in which you’d eventually like to find yourself will do wonders for your self esteem, not to mention keeping you in the loop for possible full-time employment down the line. If you absolutely must keep your current job during the transition to another career, you’re probably going to end up doing a decent amount of job-searching while at work. That means you need to be quick and efficient to avoid angering your current employers. Sign up for notifications from job sites that have positions you want so that you don’t have to constantly search. 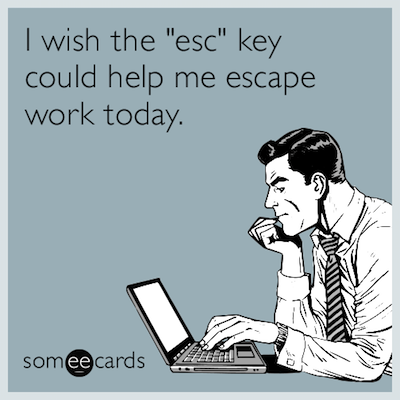 Job hunting on weekends isn’t out of the question, either. If you want to get into the restaurant or hotel business, for example, nearly all restaurants and hotels are open Saturdays and Sundays, and there are usually people in upper management positions there to meet with you. Also, more and more businesses are accepting applications online, where you can apply 24/7/365. If, while still working at your current job, you apply for a new position and prospective employers can only see you during the week, try to group as many interviews in a single day as possible, then take a vacation day (or a sick day) at work. This will afford you the opportunity of meeting with new potential employers without sneaking off for mid-day interviews. Once you’ve found a position you like and you’re offered the job, it’s time to leave your old place of employment. No matter how bad the situation was, don’t burn any bridges! Whether it’s for a reference or a legal matter that arises later on, your old employer may come in handy in the future, so you don’t want there to be any bad blood. Don’t have the qualifications to land a job in your chosen career field? Make your own employment opportunity: freelance on the weekends. It’s not an option for all fields, but you can find opportunities for everything from web design to marketing online. Or you can start your own business. Depending on the amount of money required for start-up costs, you may need to save up, get a loan, or find an investor. You should also make sure you have 6 months to a year of living expenses, since many businesses take a long time to earn a profit. Ready to take the leap into entrepreneurship? Don’t do so unarmed. Be sure to learn as much as you can about your chosen field. 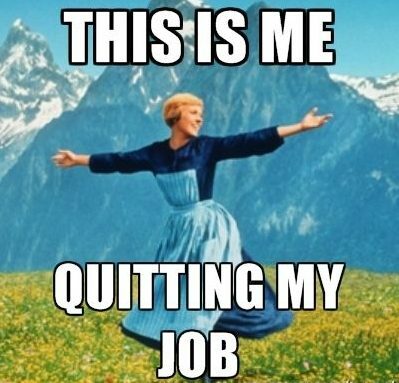 Quitting your job may be one of the most important (and possibly best) decisions you’ll ever make. You deserve to be happy! Don’t let necessity and fear stagnate your career and your life. You are currently browsing the Norwood Consulting Group blog archives for October, 2016.